Field Day 1993 started it all. 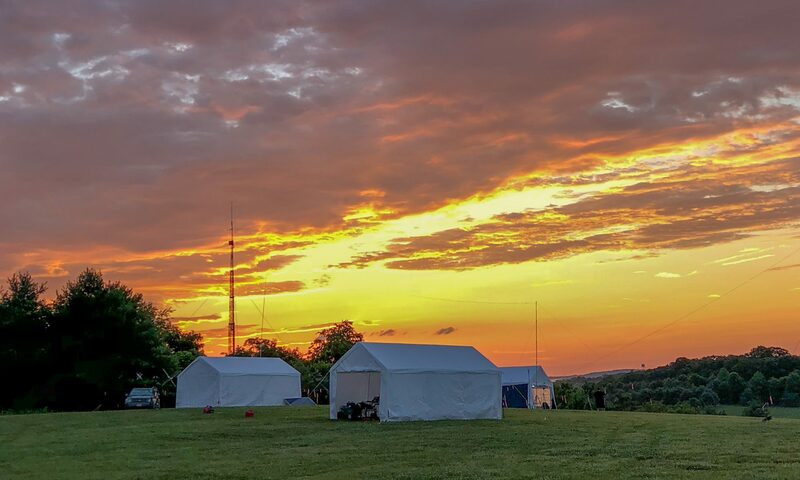 The results are in: K4LRG took the #3 slot for satellite operations in this years Field Day! Our very own Stephen Greene, KS1G, was captain for the satellite operations this year. Steve was “all in” this year as he reached for the number 1 slot in satellite operations. It was clear well before he arrived on the field day site that he had done his homework and was planning on making contacts at every available satellite pass in the 24 hours we are given to make these contacts. 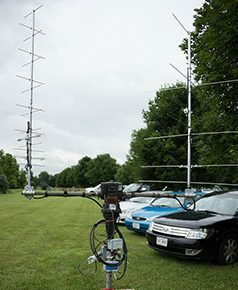 Steve Greene, KS1G, at his Satellite station during 2018 Field Day in Franklin Park, Purcellville, VA.
Steve’s antennae to work the birds. When Steve contacted me by e-mail I could sense his excitement that he had placed so high in the list. He knows the competitive landscape and knew there would be a set of stairs to climb to get to the top slots. Clearly there are some serious satellite operators out there. It’s good to see that Steve is taking notes and getting ready for future Field Days! 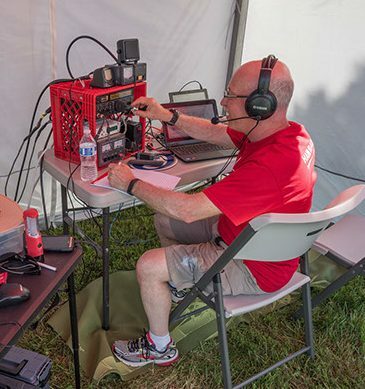 If you want to read the AMSAT publication highlighting K4LRG accomplishments in Field Day 2017 you can read this PDF which is copied and used by permission from AMSAT. This article is copyrighted. “Copyright 2017, Radio Amateur Satellite Corporation (AMSAT-NA), used by permission.” Please do not reproduce without permission of AMSAT. Update June 13, 2018: Recently Steve gave hosted a discussion where he talked about all things satellite. He had a very detailed presentation which is provided here in either PDF or PowerPoint format. Story by John Westerman, W5ODJ. For changes, corrections, omissions and the like please send an e-mail to secretary@k4lrg.org. Everyone is welcome! For more information or to contact one of us please reach out to us at leadership@k4lrg.org. We hope to see you soon!